Ted Wardell of Neptune City received the Lee Veale Award at the New Jersey Conference of Mayors Spring Conference. 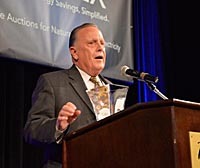 Ted Wardell, a former Neptune City councilman and mayor, received the prestigious Lee Veale Award at the New Jersey Conference of Mayors Spring Conference. The award was presented at the organization’s Board of Directors Dinner on Wednesday, April 27. In addition to holding elected office Wardell served the borough as a voluntary first responder and past president of the Neptune City First Aid Squad. He also coached various youth basketball teams. He has been a member of the NJCM Mayors Emeritus Association for 15 years. Wardell is employed by Brown and Brown Benefit Advisors as Senior Vice President of Health Benefits/ Property and Casualty Divisions. Brown and Brown Benefit Advisors is a brokerage firm specializing in the Public School market that currently represents approximately 300 school boards in New Jersey. Wardell has a professional designation of Chartered Health Underwriter from the American College in Pennsylvania. The award is named after former NJCM Office Manager Lee Veale who died in 2006.